It’s true, healthy and delicious can go hand-in-hand. 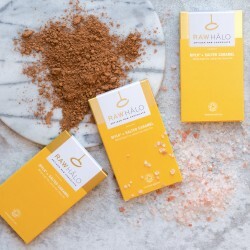 Raw, organic and 100% natural ingredients are at the heart of Raw Halo. We believe raw is best. Keeping our chocolate raw through careful temperature control and minimal processing ensures the unroasted cacao retains its high levels of antioxidants, magnesium and iron; maximising its nutritional benefits. Within our collection of bars, you’ll find a selection which are dairy-free and certified by The Vegan Society. Our vegan friendly ‘Mylk’ chocolate recipe replaces milk with organic cashews and lucuma powder. We think this gives the creamiest and most delicious milk chocolate alternative. All of our bars are produced in a gluten free environment enabling those with a gluten intolerance to enjoy our chocolate. Like you, we place a lot of importance on what goes into our bodies and where our food comes from. That’s why we always use 100% natural and organic ingredients. We avoid using refined cane sugar or artificial sweeteners, simply using a little organic coconut sugar to sweeten our chocolate naturally. 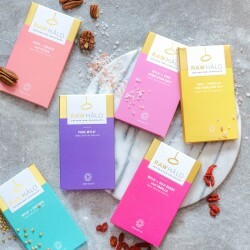 Raw Halo chocolate has won numerous awards over recent years, including 3 prestigious Great Taste Awards. • FREE STANDARD DELIVERY ON ORDERS OVER £25 BY RAW HALO.